Join the Tai Chi Qigong Centre wherever you are in the World. Your life membership will include: Two instructional DVD's, a Free Relaxation CD, Two embroidered custom patch badges, an in depth detailed guidance booklet & personal membership certificate. A Unique Personalized Membership Certificate: identical to the one shown. Actual size A4 (210 x 297 mm) and colour printed on quality card. Your own personal enrollment number as authentic proof of membership, dated and signed by the Principal Instructors authorizing your certificate. Learn & Practice the Ancient Internal Art of Tai Chi DVD with the TCQC Principal Instructor Colin Orr. 3 in 1 Tai Chi instructional DVD: covering all three sections of the original Yang Cheng-Fu Tai Chi Form. The Principal Instructor will guide you through this easy to follow uncomplicated compilation. Run time 120 minutes. Eight Strands of Silk Brocade Qigong instructional DVD: a set of soft gentle yet dynamic exercises derived from ancient times called Baduanjin Qigong in Chinese. Ideally utilized this Qigong as a warm up, prior to your Tai Chi practice or chosen sport. Run time 46 minutes. Your DVD Revision couldn't be easier with our main menu sequence selector. 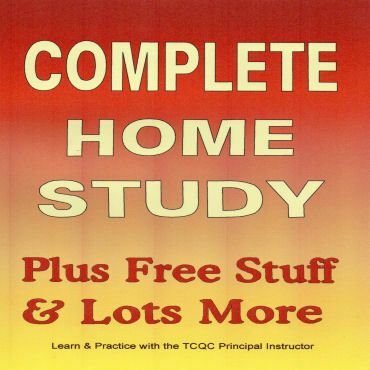 67 page A5 Course Booklet to guide and help you through your home study. 2 x Custom Embroidered Training Top Badges: one Club Membership badge and one Qi symbol badge as shown. Club badges usually positioned on left breast and Qi symbol badge positioned on right breast of your training top. This order also includes: our free Relaxation CD worth £6.99. Six meditations to soothe and relax you day or night. A simple yet powerful technique of words and and music. This offer applies to one item only when multiple items are ordered. Guidance emails when you need help. All our DVDs are region free (region 0) and will play World Wide. Click here to see help and advice on DVDs. United Kingdom: FREE (Royal Mail 1st class next day delivery). Overseas: International track + Sign For on delivery. Without writing a small novel I have had a back problem for many years and was attending physio when I started Tai Chi by enrolling as one of your Internet Members. I haven't been to physio for best part of a year now and I haven't had any further problems with my back either. Your DVD’s are easy to follow and very well presented. Dare I say I did try a few other training videos before yours but none have been so easy to follow as yours and I wanted to study the traditional Yang style anyway rather than the simplified 24 form. Thanks again Colin and Mitzi too, hopefully I will get to meet you both soon. David Rowley Tai Chi Qigong Centre Internet Member 638/123. Goods received OK, friends jealous of my Embroidered Training Top, both DVDs fantastic, very well produced and edited, the learning pace is to be commended and the information provided for each technique is excellent as well as beneficial, I have made a start on the 8 Strands and will start on the form work soon. If I lived nearer to you I would ask you to be my personal instructor. Martial arts teacher and Tai Chi Qigong Centre Internet member 557/116. Just a quick line to tell you that I have received everything through the post, and I am thrilled with it ! I absolutely love my new top, and I am looking forward to starting on the DVD’s. A quick flick through the course booklet suggests that it will be most helpful and informative during the course of my learning, and I am so pleased with my certificate of membership, that I intend to get it framed and put up on the wall ! For your convenience our shop terms and shop help can be found at the foot of this page.